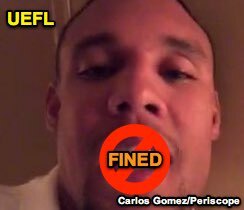 The MLB Office of the Commissioner reportedly fined, but did not suspend, Tampa Bay's Carlos Gomez after the Rays outfielder took to Twitter and live-streaming website Periscope to criticize umpire Andy Fletcher and staff. MLBUA had sought action from the Commissioner's office in a Sunday statement that made reference to a new trend of "players taking their emotions and feelings to the press and twitter to blast our umpires." In follow-up comments to Tampa Bay Times writer Marc Topkin, Gomez took it a step further, criticizing Fletcher for purportedly having "got in my face": "What does that mean? I'm a man. You do that to me in the street I'm going to slap the (crap) out of you." As for "slap the crap"...this is not a good look for a sport with recent domestic violence problems. Deja Vu: You might recall that several weeks ago, Cubs infielder Javier Baez similarly criticized an umpire's attitude, blaming Joe West for a first inning confrontation. Like Gomez, Baez referred to a key phrase that either resembles toxic masculinity and/or an inability to manage one's anger: "When somebody does that, I can’t control my attitude." Related Post: Pot & Kettle - Baez Criticizes West for Confrontation (9/25/18). Gomez also accused Fletcher of missing "more than 30 pitches, guaranteed" during Thursday's game. Fact Check: As for the true/false nature of Gomez's claims, this one is categorically FALSE. In general, when a player accuses an umpire of certain statistical performance in such a public way, we run the numbers to see how accurate the player's claim really is. Of the 149 callable pitches Fletcher saw during September 20's Blue Jays-Rays game, pursuant to UEFL scoring rules, Fletcher officiated 144 pitches correctly (103/104 Balls + 41/45 Strikes = 144/149 = 96.6%). Yes, one of those misses was the strike three call to Gomez (by 0.48 inches). No, Fletcher did not miss 30 pitches. Similarly, while UEFL f/x had the strike three call in question missing by less than half-an-inch, the league's internal grading mechanism purportedly did not flag this as an incorrect call. The problem, of course, is that the team's technology—essentially an uncorrected StatCast derivative not intended to adjudicate pitch calling—likely had this pitch off the plate by as many as two inches. Gomez in one of his Twitter tirades had alleged that the pitch missed by up to six inches. Obviously, the six-inch claim would also be false. In its own Twitter posting, the Major League Baseball Umpires Association said this trend "is an attack on the integrity of the game. The MLBUA expects ACTION from the Commissioner's Office to uphold not only the integrity of THEIR umpires but the integrity of the game itself!" Rays skipper Kevin Cash was more diplomatic, saying Gomez's social media and public comments and blanket criticisms after the game were "probably not the best way to go about it." 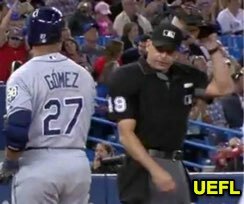 Consistency: The League's reported decision to fine but not to suspend Gomez falls in line with its Kinsler decision in 2017. That move from MLB prompted WUA to protest the League's decision. Counterpoint: Although we previously wrote how ineffective a fine is for a player who pointedly and directly said, "I got plenty of money, keep sending me fines...I don't care how they gonna react to this video...If they want to fine me, it's fine. I'm rich," Gomez also told Topkin that he plans to appeal the fine ("I don't think it's fair"), so perhaps Gomez's previous statement ("I don't care how they gonna react...if they want to fine me, it's fine") wasn't actually an accurate representation. Reading Between the Lines: Meanwhile, MLBUA's choice of words in referring to "an attack on the integrity of the game" as the result of a recent trend of players taking to social media/the press after hours to air grievances and personal qualms with umpires may not be entirely coincidental. The MLB Player's Association-MLB collective bargaining agreement contains the following clause: "The Chief Baseball Officer may choose to suspend a Player without pay for...(iv) making public statements that question the integrity of the game, the umpires, the Commissioner and/or other Commissioner’s Office personnel." Major League Baseball's Chief Baseball Officer is Joe Torre.